Fuel rate, oil consumption and sump size are critical in defining an optimum oil drain interval. 1. Fuel rate defines the heat input to piston/rings, which directly affects oil oxidation rates and piston deposit formation. 2. The oil consumption defines the rate at which fresh oil is added to the sump. 3. The sump size determines the initial amount of the oil available. Figure 1 shows a typical OEM chart for determining an oil drain interval. For instance, a truck with an oil sump size of 11 gallons, averaging 5.5 miles/gallon, with an oil consumption rate of 1,000 miles/quart should have an oil drain interval of 19,250 miles. A truck with better fuel economy of 6.5 miles/gallon with the same oil consumption rate would have an oil change interval of 23,000 miles. These charts have been developed by the OEMs to promote maximum engine durability and minimize warranty costs. Oil’s ability to disperse soot is critical to preventing soot-polishing wear. If wear occurs in the valve train system, there will be a loss of fuel economy as injection timing and valve timing will move from their optimum settings. In fact, wear as a result of fuel injection linkages can result in a retardation of the fuel timing, which further generates a higher level of soot in the exhaust and oil. Soot levels generally increase with mileage. Doubling oil drains will double the amount of soot in the oil. In some vehicle applications in which high idling time is followed by rapid accelerations, the soot level can exceed five percent. In some instances, this can cause soot-polishing wear of the valve-bridges, which will result in poor fuel economy. 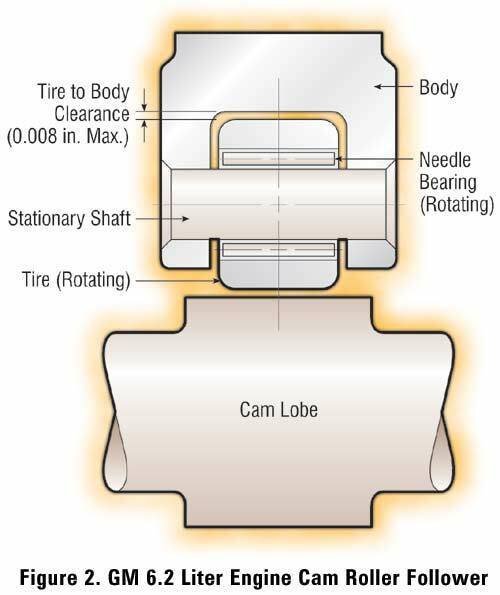 Wear of the stationary shaft in the hydraulic lifter of the GM 6.2 engine will cause camshaft failures when the roller contacts the hydraulic lifter housing and prevents its rotation (Figure 2). The oil filter is used to remove dirt and metal particles to prevent abnormal wear. However, if soot is not well dispersed it will form sludge on the filter, rocker covers and cylinder head deck. Once the filter is covered in sludge, the resulting blockage will increase filter differential pressure forcing the system into by-pass, which prevents oil filtration. This reduces filter life and will increase wear of all engine components. Sludge forms on the rocker cover and head deck because the oil runs off these parts at a relatively slow velocity, allowing the soot in suspension to drop out onto the rocker cover or head deck. This sludge has the potential to increase valve guide wear, which will increase oil consumption and blow-by. Mechanics do not like to work in an engine environment of heavy sludge, which can be difficult to remove from their hands. Thus, it is understandable that a clean engine is often one of their criteria of excellence. Reduced bearing life can stem from one of many factors including fuel dilution, coolant leaks, abrasive wear and corrosion. Increasing the oil drain interval increases the levels of abrasives, fuel and coolant in the oil. This can remove the bearing overlay and cause damage to the bearing linings. The bearing overlay is critical in providing the following properties of good bearings. Lead-tin overlay is soft and yielding and promotes conformity in the early service life without damage to the crankshaft. Some small, hard particles of dirt or metal may be embedded in the overlay and covered with a thin, soft film, preventing harmful scoring and abrasion of both the shaft and the bearing. Scuffing, galling and scoring caused by welding between the sliding surfaces can be reduced by the soft overlay. This is particularly important if the oil film between the bearing and the shaft is disrupted. 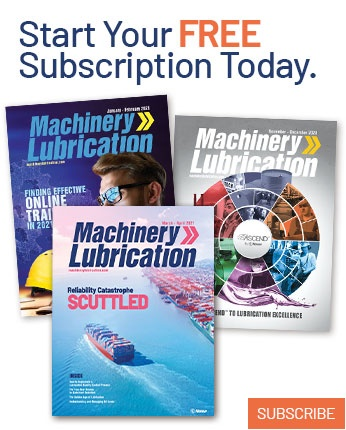 The lead in the overlay affords a soft metal that under boundary lubrication conditions, may protect the journal on starting and stopping, or other occasions when the oil is thin. This is the ability to prevent corrosive attack of the copper-lead lining which establishes the bearing diameter. The lead in the overlay is alloyed with corrosion-resistant tin. Clearly the bearing overlay is critical to engine durability. However, it can be removed through a glycol leak, abrasive wear or fuel dilution. If a coolant leak occurs at a very low level, it will cause the formation of oil balls, which can remove the bearing overlay. These balls consist of additive components formed in the presence of glycol. These balls are hard enough to abrade the overlay and thus shorten the bearing life. Abrasive wear of the overlay, due to inadequate oil filter operation or excessive amounts of soot in the oil, can also shorten bearing life. In addition, fuel dilution will reduce oil viscosity and the oil film thickness between the bearing and the crankshaft which will result in wear. Finally, bearing corrosion can result from insufficient base (BN) in the oil, which results from extending drains beyond the oil’s capability. OEM recommended oil drain intervals are conservative. By design, the recommended cycles promote maximum engine durability, sacrificing lubricant longevity (remaining lifecycle). The recommendations are intended to allow for a missed drain. For instance, if the normal drain for a truck is 15,000 miles, but a drain is missed and the drain occurs at 30,000 miles, the oil should still provide protection. But if the drain is 30,000 miles and a missed drain resulted in a 60,000-mile drain interval, damage to the engine may occur. Normal oil drains provide a margin of safety and ensure engine durability. Changing standards to lower exhaust emissions has resulted in increased fuel injection pressures and a corresponding increase in cam stress, because they actuate the unit injectors. To address the changes, cam metals, hardness, surface finishes and profiles have been significantly improved. In fact, Detroit Diesel has moved to an expensive silicon nitride roller on a steel pin to accommodate higher loads under marginal lubrication conditions. Regardless, soot overloading can lead to abrasive wear between the rocker shaft and rocker bearing that is sufficient to cause rocker arm seizure. The cam system is the Achilles heel of today’s emission controlled engines. 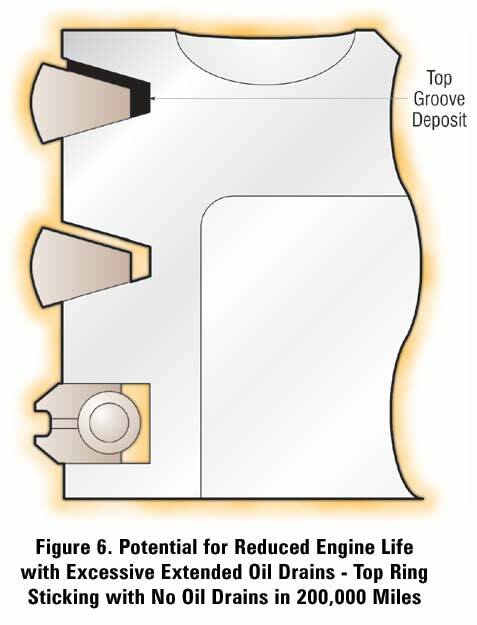 The engines need adequate lubrication with minimum debris and soot in the oil films between critical components. With normal engine wear rates, used oil metals increase linearly with an increase in miles. In doubling the normal oil drain from 16,000 to 32,000 miles, the used oil metals increase as shown in Figure 3. Abnormal wear results in a rapid increase above the linear line indicating a problem. In contrast, the oil’s base number generally decreases in a linear manner, as acids are neutralized at a constant rate (Figure 4). To prevent corrosive wear of the rings/liner and bearings, it is necessary to maintain alkaline reserve such that the oil’s base number does not drop below 3.0 as measured by D2896 or 1.5 per D4739. In extending the oil drain interval, there is an increase in the oil contamination, combined with a reduction in the oil base reserve (BN). The end result can be a loss in power. In severe field testing in Canada with 430 hp engines, it was found that extending the oil drain from 12,000 miles to 25,000 miles combined with a reduced sump volume resulted in a loss of power, as measured on a chassis dynamometer (Figure 5). This loss was believed to result from increased ring face and groove wear, which increased engine blow-by. 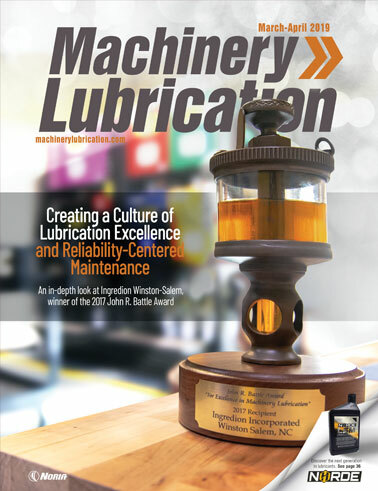 In the 1970s, Mack engines were evaluated with no oil drains for 200,000 miles. Only make up oil was added to the engine. The result of this field test demonstrated that some of the top compression keystone rings were stuck due to deposits, resulting in high blow-by and a loss of power (Figure 6). Engine oils are formulated with oxidation inhibitors and detergents to minimize deposit formation. These additives are depleted with time and should be replaced to maintain adequate deposit control to ensure free operation of the rings, to seal the combustion pressure and to maintain oil control. Although seal leakage due to extended oil drains has not been experienced, it has been reported in Europe in gasoline engines. The leakage is due to an increase in particle formation at the seal lip, which can accelerate wear between the seal and the crankshaft, and contribute to deterioration of the elastomer. 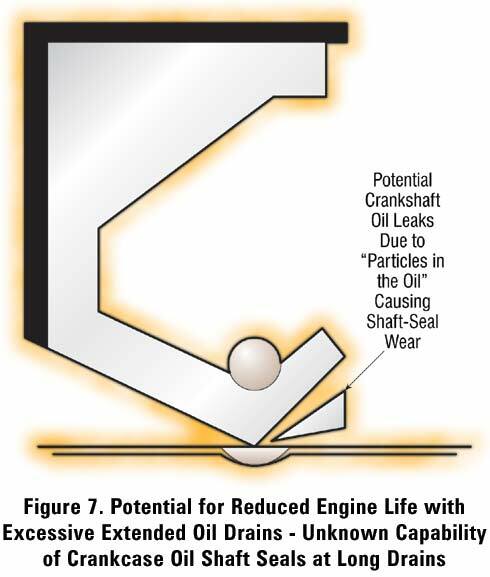 In this study, normal oil drains provided longer seal life than extended drains (Figure 7). It is important to remember that when draining the used oil from engines, not all the oil is automatically drained. The oil plug location is critical to adequate drainage, but some used oil often remains in the engine. This oil is highly contaminated, and the additives are depleted. The longer the drain interval, the more highly contaminated the oil, and the higher the degree of additive depletion. When the fresh oil is added, it is mixed with this used oil. Considering all the factors, the OEM recommended oil drain interval, combined with high quality engine oil provides the best insurance of engine durability. Unlike gear cases which are enclosed, the engine is continuously producing blow-by which carries soot, corrosive acids, condensation (water), unburned fuel, dirt, coolant and wear metal to the oil. So the appropriate oil drain interval is critical to engine life and trouble-free operation. Rigorous maintenance practice in changing fluids, as exemplified by the aircraft industry, provides safe and trouble-free operations. Considering all the potential for reduced engine durability, caution must always be applied in selecting a drain interval other than that recommended by the OEM, even with a high quality engine oil.